Having enough space in the memory drive of your camcorder is almost a must. But what if you have an SD card inside it which won’t let you take more than 200 photos or 30 minutes of video? Frustrating, right? It actually ruins the entire purpose of using even the camcorder itself. So, if you’re on the way to get a new SD card for your camcorder, we would urge you to take some time to read this post first. 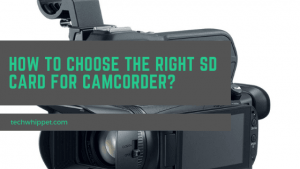 In this article, we’ve backed you up with some exclusive tips on how to understand the specs of an SD card, how to understand the compatibility of an SD card with a camcorder, and finally, how to choose the right SD card for camcorder. What Is SD Card and How Much is Their Capacity? First of all, the SD card stands for Secure Digital, which is a close cousin of Secure Digital High Capacity(SDHC) cards. Primary, some companies had begun marketing this product with the name of the video card. So, you might recognize it in that way also. Now, let’s learn about the range of capacity of these cards. SD cards are available with a 2GB capacity, where SDHC cards come with an even higher capacity of 4GB, 8GB, 16GB or even 32GB of memory. And a basic sense is, the higher the capacity is, the more photos or videos you can record and store in the camcorder memory. In practice, we usually use SDHC cards, which are sometimes, called as SD cards in short form. Are SD and SDHC Cards Compatible with Camcorder? SDHC Cards and SD Cards. SDHC Cards(with SD cards compatibility as well). Now, sometimes, camcorders come with a label of “SD Cards Only”. That means that it won’t be compatible with any SDHC cards. So you have to stick to a 2GB memory space in it. How to Choose the Right SD Cards for Camcorders? Well, we are at the center of the article right now, and here we’ll be providing you a series of buying suggestions. Hopefully, these will lead you to understand which SD card is the best fit for the camcorder model you’re using. It’s a very basic factor to decide. And we always want to go for as bigger(in size) as possible. But you know what? There are sometimes when you don’t need to end up with either excessive or insufficient space in the card. Audio Only Recordings: 2 to 4GB of SD cards will do. Audio and JPG Image Capturing: 4 to 8GB of SD cards will do. Audio, JPG Image Capturing, and Raw image capturing: 8 to 16GB of SD cards will do. Audio, JPG Image Capturing, Raw image capturing and SD video: 16 to 32GB of SD cards will do. Audio, JPG Image Capturing, Raw image capturing, SD video and HD video: 32 to 64GB of SD cards will do. Audio, JPG Image Capturing, Raw image capturing, SD video, HD, and 4K video: 64 to 128GB of SD cards will do. How Much Speed of the Card You Need? The speed of the SD car is really a deciding factor when it comes to camcorders. So, don’t do that mistake of overlooking this fact as many video recorders do. There are 6 different speeds in SD cards. These classes are- Class 2, Class4, Class 6, Class 10, U1 and U3. This list is according to from the fastest to the slowest in terms of SD card speed. A basic understanding of the class and speed is- if your car is of Class 2, it would have a transferring capacity of 2 MB/s. On the other side, the fastest kind of speed is Class 10, which comes with a 10 MB/s speed rating. What to Choose Among SD Cards, SDHC Cards, and SDXC Cards? Although it’s not a direct buying point about a camcorder SD card, it’s important. So far, we’ve taken SDHC cards as the standard camcorder memory storage. And the SD cards are outdated because of poor speed and capacity. But the next level technology of SDHC is already there in the market. So, in case you would like to make your experience even better, you can go for SDXC type of models. The major benefit of these memory cards is, they come with an incredible speed of up to 2TB. Also, the transfer rate of SDXC cards is also high, which seems to be around 300MBPS. The last factor of this discussion is quite obvious when it comes to buying any electronics products. Although it’s a competitive market, but sometimes users have to pay more not for the quality and capacity, but for the brand value. In case you’re one like-minded person, we would advise you to be certain about what you’re spending your money after.